HelaGuard Conduit and Fittings come with nickel-plated solid brass. Featuring superior-quality compression seal, HelaGuard Conduit and Fittings are suitable for maximizing product reliability in manufacturing, machine building, shipping and chemical industries. Designed with galvanized, jacketed, liquid-tight metal core conduit for flexibility and crush resistance, units protect electrical wires from mechanical failure caused by vibration, impact and moisture ingress. HellermannTyton, www.hellermann.tyton.com, announces the availability of HelaGuard Flexible Metallic Conduit and Fittings. This addition to HellermannTyton’s electrical protection solutions follows a tradition of no-compromise products designed to protect electrical wires from mechanical failure caused by vibration, impact, corrosion and moisture ingress. The HelaGuard Flexible Metallic Conduit series targets the OEM and wholesale electrical markets, including manufacturers and installers concerned with extending product durability and longevity. The product line includes galvanized, jacketed and liquid-tight metal core conduit and tubing for exceptional flexibility, crush resistance and safety. Complementing the line, HelaGuard Metallic Fittings differentiate this product family from many others currently on the market. Each fitting is made from nickel-plated solid brass and is machine tooled to extremely tight tolerances. Compatible with any conduit made to UL360 standards, these fittings feature a superior-quality compression seal that delivers excellent ingress protection in demanding environments. HelaGuard is ideal for maximizing product reliability in manufacturing, machine building, shipping, offshore, mining, rail infrastructure, rolling stock and chemical industries. This product introduction joins the company’s already extensive line of flexible non-metallic conduit and fittings – in addition to thousands of related products – to expand the range of applications that can be addressed from a single source. 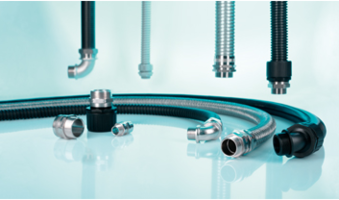 Find further information on HelaGuard Flexible Metallic and Non-Metallic Conduits and Fittings at www.hellermann.tyton.com or by emailing Toni Parker – tparker@htamericas.com. HellermannTyton is a global leader in cable management and protection products, identification systems and network connectivity solutions. Its systems and solutions are specified by major manufacturers and contractors in the electrical, OEM, datacom, automotive, heavy equipment, renewable energy and related industries. The company’s engineered solutions and innovative products are designed and constructed to meet the strictest quality standards while delivering reliable implementation at the lowest cost. HellermannTyton operates in 37 countries, with North American headquarters in Milwaukee, Wisconsin (www.hellermann.tyton.com).